Howdy! Today we’re gonna do things “Texas style,” or at least what new players such as myself like to do, which is find as many interesting new weapons as possible and leave our stock loadouts behind. Yeee-haw! Oh… dead again. But I was so sure my Crusader’s Crossbow would do the trick. Now we start again. Since I know Medic quite well, I hear a lot about how it’s bad to just equip new items as soon as you get them. Assuming a new weapon is better than the stock equivalent usually ends in a horrible death and/or ragequit. This is one of the reasons I only ever consider stock weapons when writing here. 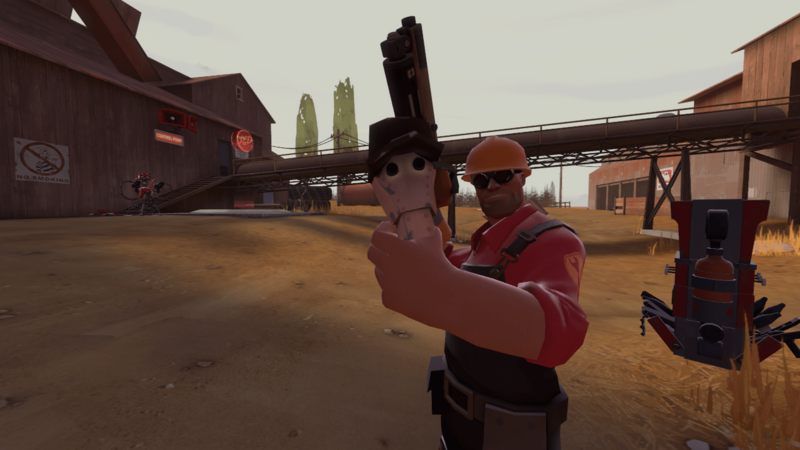 Other reasons are, as I’m still relatively new to TF2, I don’t have many non-stock stuff. Also there are lots of great articles already on this blog covering various alternative loadouts, many of them surprising successes. 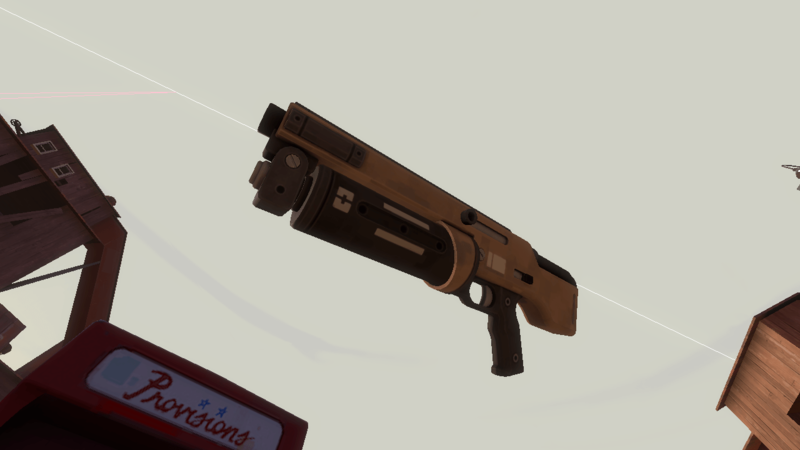 However I have one exception: the engineer’s shotgun. In fact, the standard shotgun used by four different classes. I’ve never been very good at aiming it, let alone killing anything with it. Put a rocket launcher, flamethrower or minigun in my hands and suddenly pools of [Jarate] appear underneath all enemies. But not with the shotgun. So I work around this weapon; as Heavy, Soldier and Pyro I stick to the primary weapon and keep a close eye on my ammo. As Engineer the shotgun is my primary; but I don’t want to try fighting with it or the secondary pistol! 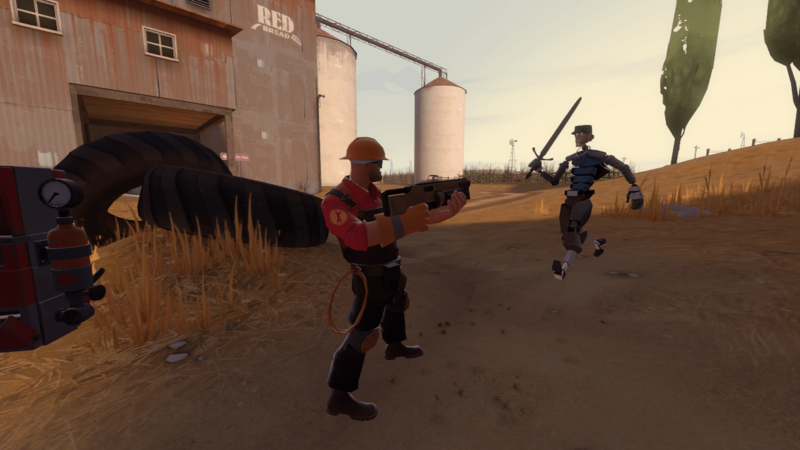 You’ve probably at least heard of the Gunslinger, the Rescue Ranger and the other fantastic-sounding weapons available to the Engineer. These have their own strengths and flaws and have been covered in other articles. I don’t use any of those. You see, I only play as Engineer in MvM missions. Picture the situation. A horde of clanking Scouts has slipped past my teammates and taken out my dispenser. So I need to backtrack and find some ammo, but while I’m doing that, a Sentry Buster sends itself to android hell and takes my turret with it. More robots are closing in, what can I do? RED Engineer solves another practical problem. But of course! I pull out my trusty Widowmaker, squeeze off six shots, then re-build my stuff and wait for the next wave. It’s the one weapon I prefer over its stock equivalent and, I feel, one that is often overlooked. Agreed, in normal multiplayer games, the Widowmaker can be a let-down. It does the same base damage as the normal shotgun, but it uses metal as ammo and has no reload requirement. You chew up 30 bits of metal per shot, so it can shoot six times before needing a recharge. This might sound like a big disadvantage. If you want a steady supply of ammo, you have to stick close to your dispenser, making you a more vulnerable target. What sensible Engineer would possibly put themselves in that position? Fear not, the Widowmaker may sound like a waste of resources at first glance, but it only goes uphill from here. This gun actually gives back metal based on how much damage it inflicts. Being a shotgun, it does quite a lot of damage at close range, so if you’re any good at all with it the “metal ammo” thing fixes itself. And because it doesn’t need reloading after every shot, it has a faster firing rate than a normal shotgun. Well that sounds better, doesn’t it? Widowmaker: Just a wannabe shotgun, or something better? Now we come back to MvM, where it becomes really useful. In this gamemode you get many upgrades for your weapons (and self), two of which work very well with the Widowmaker. One of them increases your maximum metal capacity, the other gives you the ability to regenerate metal over time. Hmmm… so what if we invest some cash in these? What happens is that you end up with a lot of metal in your pocket and a certain amount is replenished every second. Without even maxing out either of these upgrades, I managed to create an Engineer who carried enough and regenerated enough metal to give the Widowmaker infinite ammo. In other words, whenever I used it, I got that 30 metal back instantly. Without being anywhere near my dispenser or even taking into account the return from hitting a robot. Yeeeeee-haw! So you see folks, it just takes a little bit of thought and experimentation to turn a weapon like this into a really useful killing thingie. I like the Widowmaker a lot. I like it because it’s so seemingly ordinary, just with that ammunition quirk. In exploiting said quirk it’s possible to turn this machine into something more than a mere shotgun. No wonder they give it such a deadly name.